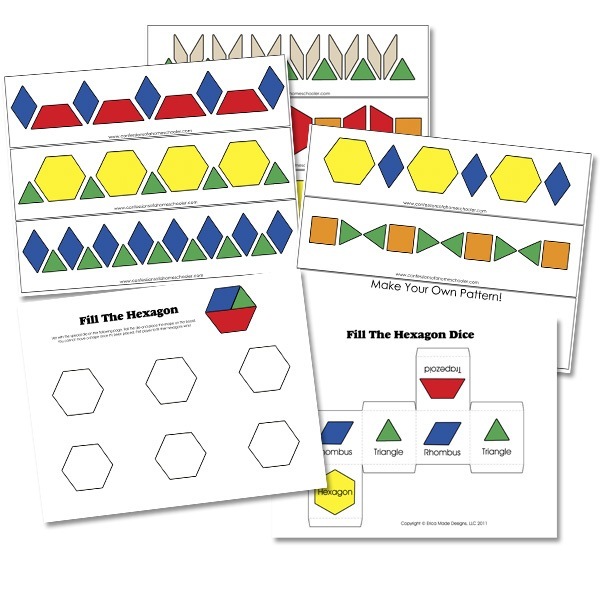 Hi everyone, I have some fun pattern block activity cards to share with you today! My kids love doing patterns and the picture cards using the pattern blocks, and so awhile back I made some preschool pattern cards for you all. Today, I added in a fun game called “Fill The Hexagon”. It’s great for spatial recognition as well as teaching the names of some new shapes. I got my Wooden Pattern Blocks Here . And I also found some free downloadable cards with easy Patterns at Prekinders. They also have a TON of other great ideas there too! 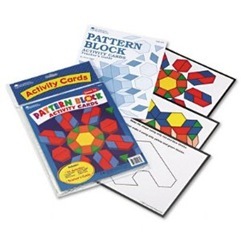 For my older kids I also have these Pattern Blocks & Cards. 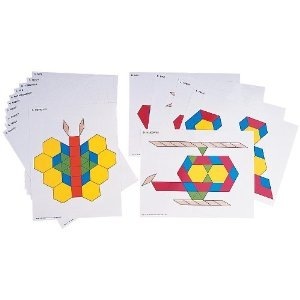 They’re great for logic, patterns, shapes and puzzle making. It also takes some dexterity to place each shape on the board without disturbing the others. I found some pattern cards for younger kids here. Okay. A little slow here this morning…. Did you create a set for us to print and use or are you just sharing good ones you have found? I can’t find a button to print yours… Help! Carissa I too must be a little slow on the draw this morning b/c I couldn’t figure out how to print Erica’s pattern pages; however, the link she give for Prekinders has some free printables that I was easily able to download, including some really cute ones to stash away for Christmas time. Though I would still like Erica’s if they are indeed supposed to be available to us. Erica you save me so much time thank you for all the free printable you make available to us and thank you for all the ideas you share with us on how you make your journey as a mom and homeschooler. I have never seen pattern block cards for older kids. Thanks for letting me know about this. I wasn’t able to find the link either, but I did find the cards under My Printables –>Math. Thanks for directing me to the My Printables-> Math. Here is the direct link to the pattern blocks. I would love the fill in the hexagon game. I did not see that in the printables section. These are great! Thank you again for all of your time and blessings to us! Hi. We love pattern blocks, but the cards that I purchased with ours are a little tricky for my littlest two, so thank you for these patterns. They’re perfect. I am looking for the fill the hexagon game though. It looks great. Is that a downloadable? Sorry everyone! The Hexagon game is fixed now! Thank you so much for your generosity. I love the build a hexagon game and was wondering if you had printables to make the dice out of the photo blocks? My little guys tend to be rough and I am not sure a paper/cardstock die would last too long. If not, we will give the cardstock die a whirl, but it never hurts to ask.